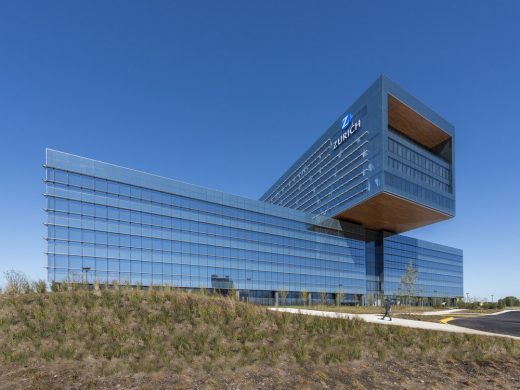 Architecture firm Goettsch Partners (GP) celebrated the opening today of the new North American headquarters for Swiss-based Zurich Insurance Group in Schaumburg, Illinois, marked by an official ribbon-cutting ceremony. 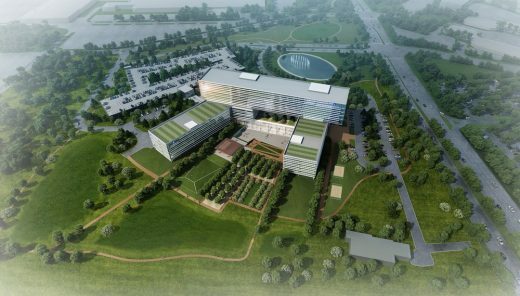 The 783,800-square-foot building will be home to nearly 3,000 employees and contractors, and was designed with an emphasis on communication, collaboration and wellness. 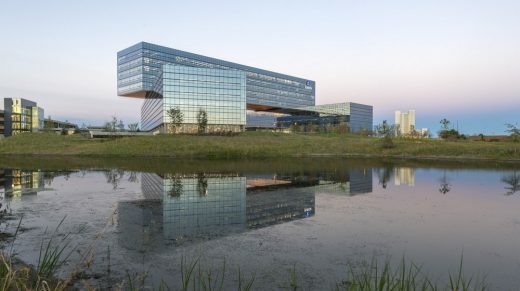 GP designed the Zurich North America Headquarters to reflect the company’s global reach and world-class stature. The formal architectural resolution strives to represent both strength and stability, which are core values of the Zurich business model. 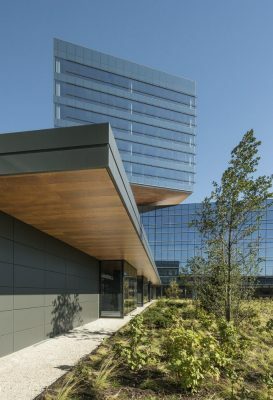 Composed of three primary “bars” that are offset and stacked, the arrangement creates unique spaces for collaboration, opens views of the surrounding landscape, optimizes solar orientation for amenities, and provides programmatic flexibility not found in typical center-core office buildings. The top “bar” of the complex soars 11 stories and cantilevers toward downtown Chicago, providing visual identity along the interstate while projecting the strength and future focus of the company. 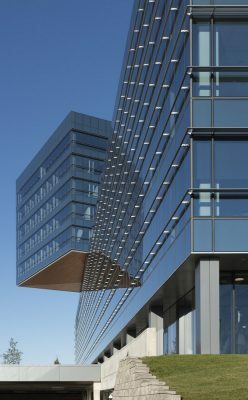 Recently certified LEED Platinum, the complex reinforces Zurich’s commitment to environmental stewardship. 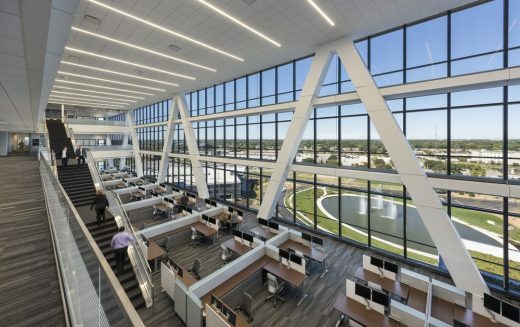 A network of horizontal sunshades clads the perimeter of the complex, with the sunshades varying in depth depending on orientation, while floor-to-ceiling glass offers extensive natural light for the shallow office plates. A soaring three-story double wall faces south toward the multi-level plazas, showcasing an architecture that responds to the changing Chicago climate. 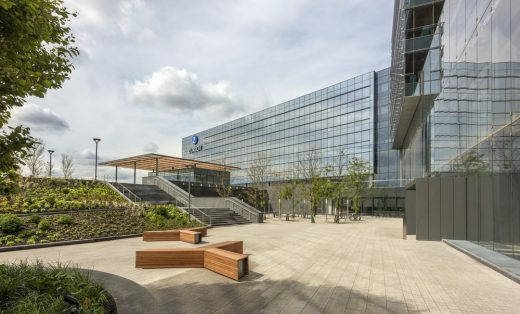 In the end, a timeless material palette married to a bold, clear form creates a unique identity for the Zurich headquarters that embodies the core values of the company. 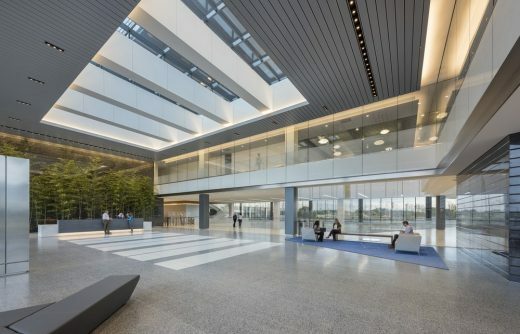 “This building is a showcase of all we are at Zurich: its excellence in design, its focus on sustainability, and its reflection of our employees,” said Mike Foley, chief executive officer for Zurich North America. 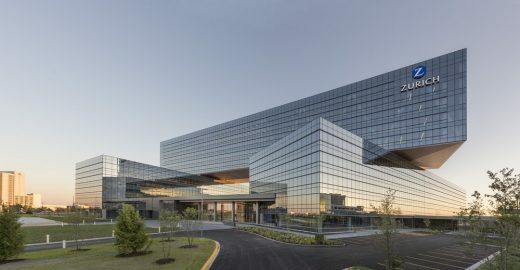 In addition to GP as the architect, the project team included Zurich (client), Clayco (developer/design-build), JLL (client representative), CannonDesign (interior design and workplace strategy), WSP/Halvorson and Partners (structural engineer), Hoerr Schaudt Landscape Architects (landscape architect), and V3 Companies (civil engineer), among others.